The nearest to life like - easy to see Blowfly design you will ever buy. Only avaliable at Stu's Fly Shop. 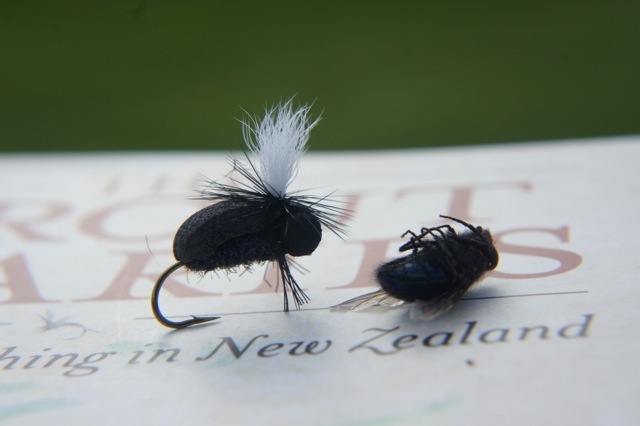 Stu's Deadly NZ Blowfly design - unique! The book they sit on is the best trout book that you will enjoy that has been printed in years. The Interview - 53mins of Fly Fishing, History, Casting, Tips, Fun, Fly Tying and Fly Design - enjoy! Yes - at last the author of the top selling trout book "The Trout Diaries' and producer of the Trout Diaries radio show - got hold on me. Derek asked me quite a few questions over 50 min and recorded it live. There was no written down questions and answers, a microphone was just held in front of me and we just did it. The interview has had well over 600 downloads and is still rising, this has surprised us both. It just shows when the truth is told and some good information is given people do listen. So if you have not had a listen to it, stick on your head phones, crank up the volume, click here after reading the blog and even without being on the water, you will be taken on that thought provoking journey into the world of fly fishing, guiding, casting, catching fish, fly design. If you like it let your fishing club members and friends know and share the passion, without our passion we would not have as many waterways full of life! Stu's Superior Flies do the damage again - Stu's Deadly NZ Cicada chartreuse size 10, fooled this 1/2 pound trout for another very happy client. 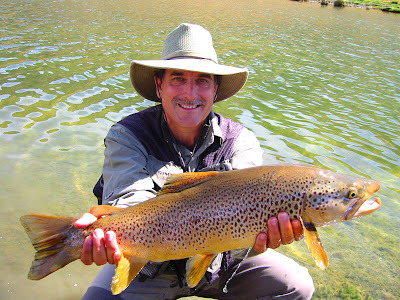 If you are looking for some of the best mayfly hatches April is the time to come to southland fewer fishermen around and plenty of cool water., living on the river means i get to know first hand what is going on in the trout world in Southland. Some dates are available for the end of March and April , call or send me an email for that small dry fly fishing fix. Remember there are not many guides who live on the river or have spent as much time on the water, ,there is not much i do not know about whats going on in the southland trout world, Local knowledge you will not find just anywhere! The new Superior Flies Film - the history, big fish, the journey, the years of design, the art , passion and dreams - enjoy! The new short film has been very well received through out the world and great comments and feed back have been coming in. 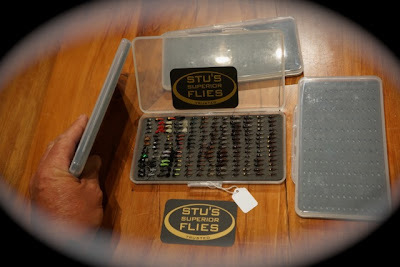 One person commented that I had the flies in my box the wrong way! Never said it was a good clip and congrats, just wanted to let me know !!!!!! wrong!!! But was I :) ? Allot of the times I'm not right but who always is? But he did make me realize why for many years I had changed the way I put the flies into this box. My vest and box get thrown around when I'm guiding and the odd time my nymphs would fall out. With the tungsten little heavy nymphs mainly, I found they would not fall out of the foam slots as much if they were put in the other way round. Just like how you hold a rod there is no right or wrong way as long as it works for you. So now you are going to watch the film and the flies and box and it's going to get you thinking and that's the magic of fly fishing - it's a game of thinking and working things out and just when you think you have it cracked. You have to start again- it's great, the learning never stops. To watch the film clip remember post it on your social media site and enjoy and share it. A range of mayfly designs from my vise, all ready for the hatches.These mayfly designs work throughout the world. Well, it's been very hot and most of the small streams have dried up and many fish have died - which is a shame. Some have been rescued by Fish & Game and many by caring members of the public especially some awesome farmers. Lots of these small streams are spawning streams for the trout , so I would imagine that many small trout have died and the long term out look is not so good. Hopefully nature will take it course and things will pan out. Many farmers have been stopped from getting water from the ground as all the rivers are getting so low . Environment southland are the ones who regulate this. My house water comes from rain water, which is stored in a tank which is also getting very low, so rain is need all round. Fingers crossed. 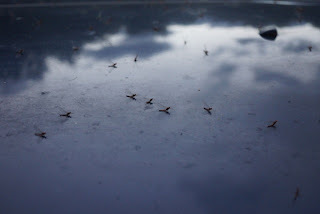 Mayfly spinners on my car early in the morning before guiding. The Guiding - Mayfly Hatches - available dates! It has been a terrific year so far with clients enjoying great fun days on the water with plenty surface action. The hot weather has made the fish all look towards the surface as the bugs keep floating down on mass. Less water means less places to hide so spotting fish is at its all time best for me and clients. The visuals have been awesome with many clients pulling the fly away before the trout takes in excitement, especially when fishing the Willow Grub up close. Recently there has been some large mayfly spinner falls more than normal in March, which means April is looking great for the autumn mayfly hatches. Cicadas are still around and fish are still munching on them, as well as Willow Grubs - which are still dropping big time from the leaves. If you are looking to catch some beautiful colored mayfly feeding trout before the season ends or brush up on your casting or river craft skills, look no further. Check out the new super slim fly boxes - you can buy now - custom selected filled box - full of Stu's Superior Flies - all tied on the best TMC fly hooks. Just contact me today and let me know your custom wishes. I still have a few days available in March, April and May so contact me today. Much more than just a wee shop! This season I decided to sponsor the full Rise Fly Fishing Film Festival tour and take Stu's Superior Flies to world and chase the dream! The feedback from the tour has been great from so many countries and passionate fishermen and women. The tour - I'm pretty sure - has rekindled many peoples love for fly fishing, especially in the cities. To be able to go along to a venue and meet like minded people and watch some of the best fly fishing movies in the world just makes many people realize what more destinations and species can be caught on the fly. Here is another wee tune to listen to, that may get your feet tapping.Its nothing to do with fishing or is it?